Working as an OUP lexicographer analysing the corpus of the BBC Radio 2 500 Words competition is a fascinating and enriching experience. You don’t get to read the whole 500 words of any one story, but rather little bite-sized chunks of no more than one or two sentences at a time. These isolated extracts from different stories appear on your screen, brought together by the computer and offered up to you because they have all used the particular word you have searched for. So you read them, one minute in the middle of a space adventure, the next minute transported to a war zone, then a fairytale kingdom, and so it goes on. Gradually, through the mass of characters and imagination and humour, patterns begin to emerge – particular topics and ideas crop up more than you would expect, words recur in unexpected ways, and little by little you begin to get a feel for the things that have been inspiring, preoccupying or even worrying children up and down the country over recent months. One thing which came as a real surprise to me was the extent to which current affairs featured in the stories. Ukraine, for example, has definitely become one of the settings of choice for war stories this year. The stories included a mixture of fantasy tales which just happened to take place in a country called Ukraine (I remember one featuring giant ants) to those which attempted to create more realistic narratives, bringing in elements of the current political situation. There were also mentions of the mysterious and still unsolved disappearance of the Malaysia airlines plane, including one story in which the main character (a girl) was sitting on the plane reading tweets about a plane that had disappeared, and realising that she was on it! Unfortunately, I didn’t find out how the story ended because it was intriguingly cut off mid-sentence on my screen, like all the rest. But the news item which really jumped out at me from the stories was the Ebola epidemic. There were just so many mentions of it, and in so many different ways. There were tales of children in Africa who had miraculously survived the illness and stories of global Apocalypse brought about by the virus. But, most frequently, there were tales of people searching for, and finding, cures in all kinds of unlikely places, from mixing chemicals in laboratories to seeking out rare plants, or even accidentally discovering the marvellous healing powers of meerkat saliva! And what came through all the stories was a strong thread of empathy and compassion for the victims of this illness, and a real desire to do something to help. From a language point of view, it was interesting to see how the vocabulary related to the hot topics of this year also came into prominence. The Ebola crisis sparked more uses of words such as quarantine, vaccine and bacterium and the interest generated by First and Second World War commemorations gave rise to the use of words such as shrapnel, mustard gas and U-boats. It was impressive to see how readily children’s vocabulary can expand as they learn and write about new subject areas, and surprising to see how easily technical words can become part of everyday usage, and seemingly ‘dormant’ historical words can be revived and brought back into the current language. Overall, the impression I came away with after my time studying the corpus of this year’s stories was of children who are not only creative and imaginative but also interested in the wider world and concerned about what is happening in it. There were mentions of more different countries in this year’s stories than ever before, suggesting that children are looking outwards more, rather than being concerned with just their own country or local area. Perhaps this shows a positive side of the internet and social media, in that these tools allow young people now to feel more connected with other parts of the world than would have been possible in the past. Maybe next year’s stories will help answer these questions. I’ll certainly look forward to reading them – or extracts of them, at least! 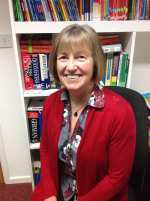 Sheila Dignen is a freelance lexicographer and writer of materials for learners of English. She has worked on many dictionaries, including the Oxford Junior Dictionary and Oxford Junior Thesaurus. She is also the co-author of the Oxford Dictionary of Reference and Allusion.